Why Should I Partner with Phase I Environmental Site Assessment Companies Near Me? Investing in a property is a significant decision. Before you put everything on the line, it’s important to gather the data you need to make an informed decision. How? By partnering with an environmental firm. Of course, a search for “Phase I Environmental Site Assessment companies near me” will yield several place hits and about 62,000,000 results. The key is to choose the right one. How can you narrow this search? How can you find the right company for your environmental needs? You must ask three strategic questions. Why would I need a Phase I Environmental Site Assessment company near me? Your launching point in this process must be a solid understanding of the importance of a Phase I Environmental Site Assessment (ESA) company and why it’s essential to partner with one headquartered in your area. The role of a Phase I ESA company is to protect you from liability related to environmental contaminations on the property in question. The firm completes the assessment to identify recognized environmental conditions that the property may have die to previous uses. By performing this assessment, you will satisfy the All Appropriate Inquiries (AAI) in accordance with ASTM 1527-13 and qualify for protection under the “innocent landowner defense.” If you plan to invest in a commercial or industrial property, this process is vital to the future success of your project. The other crucial component of a Phase I ESA is local knowledge. A lot of firms can complete a Phase I ESA, but not all have relevant experience in your region. A company in your area offers specific knowledge of the environmental conditions and challenges of the local region. This can prove invaluable for Phase I ESAs. A local firm can also offer in-person meetings that can be critical to the process and, if needed, can provide expedited services more easily than a non-local firm. What should I expect from Phase I Environmental Site Assessment companies near me? Once you realize the importance of this partnership, the next step is to identify what qualities to look for in Phase I ESA companies. Not all environmental firms are created equal. To find a partner you can rely on to deliver the services you need, look for three fundamental qualities. Comprehensive Solutions: What if your Phase I ESA reveals environmental concerns? Can the company offer additional services? Choose a partner that offers full-service solutions to handle all aspects of your project. This will provide a streamlined process that can address all areas efficiently and cost-effectively. Comprehensive Results: Research the company’s track record of results. Do their submission methods lead to approval? A firm worthy of your trust uses proven testing and submission methods that result in a significant number of project approvals. Which Phase I Environmental Site Assessment company near me should I choose? Based on the foundation you’ve built by answering the first two questions, your final step is to select a Phase I ESA company. 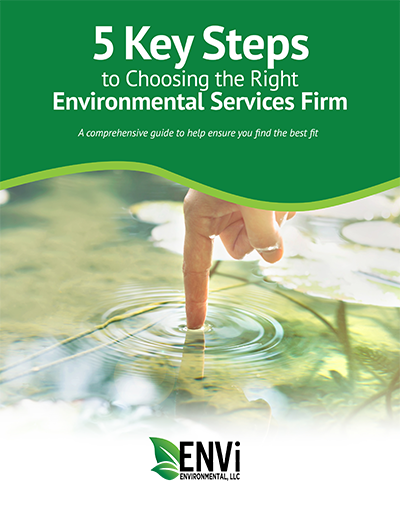 As you review your options, consider what ENVi Environmental brings to the table. Local Expertise: ENVi Environmental offers more than 20 years of local experience. Our Phase I ESA reports are based on our comprehensive knowledge of the regulatory requirements in Cleveland. Thorough Phase I ESAs: ENVi Environmental prepares detailed and comprehensive Phase I ESAs that are compliant with the ASTM 1527-13 as standard practice. Complete Services: ENVi Environmental’s ENVi 360™ Solution covers the full spectrum of environmental services. In addition to due diligence, we also provide remediation, permitting, waste management, and compliance for your project. Positive Outcomes: At ENVi Environmental, our consistent, detailed methods result in a high approval rate for the projects we submit to regulatory agencies. Minimize your environmental risk and maximize your investment by partnering with the professionals at ENVi Environmental. Our team offers an efficient, seamless approach from start to finish. Contact us today to find out more about our Phase I Environmental Site Assessments and how a partnership with ENVi Environmental can benefit your business.